Hi all, well I have done a little tidying up from things piling up on my table. I was involved in a private trade and finally got everything done and sent off today. I joined a new swap blog and I will give you links to all the blogs involved in my post as I go along. This is a little long winded so be warned. First up I wanted to share this darn cute birdie mini domino book I made. 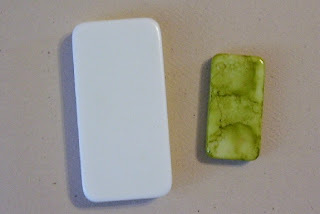 My friend Becky had sent me some mini dominoes late last year and I made some necklaces with them but after doing a few large domino books and I really enjoyed them, I thought, why not do a few minis and then I can send them to swap partners now and again with my trades. 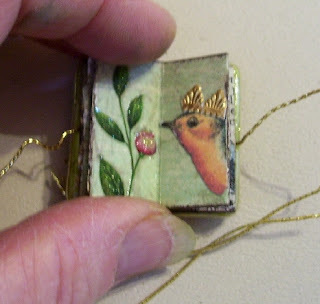 Since signs of spring have been on and off the last week or so with some warmer temps, birds starting to return and the days are lasting a little longer I was inspired to make this mini bird book. So here is what it looks like, click on the pics for a larger view if you have trouble seeing some of my details. These were fun and so very addicting. 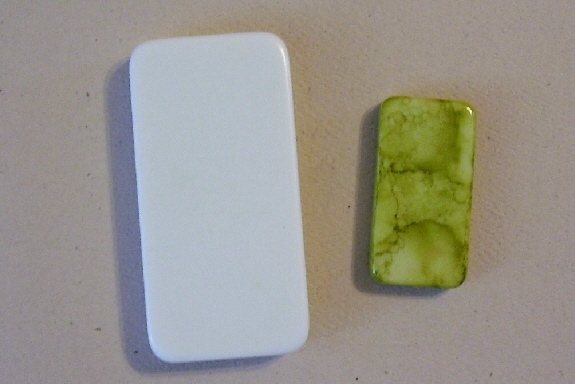 Below is a regular size domino and the little one is the size I just finished making, cute huh? I alcohol inked them in my fav colour and it reminds me of spring and all it's new growth. 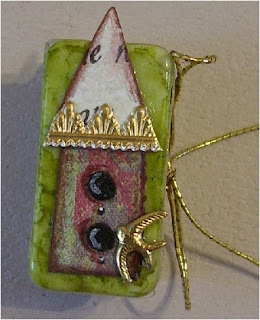 I used scraps of paper, I found a bird charm, how lucky was I, thanks to a past swap partner I think was Smifferoo aka Jan. I punched out some black paper for the holes and then put a white gel pen to make it a shadow and then used pencil crayon on the outside around the one side to make them pop so the birdies can see their way in. another rub on, an inchie bird stamp cut out and a definition of bird from a dictionary used just for art. 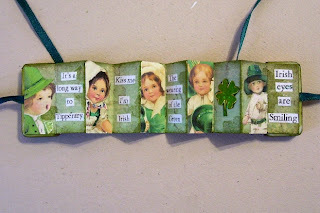 Next up is another domino book that I made for St. Patrick's day using some free images from Leanne Seeds blog, Fripperies and Butterflies, and as I told you in a previous post, I will be a guest artist come this August for her Gecko Galz digital scrapbooking store. 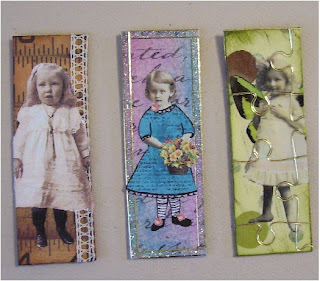 If you go to the Fripperies and Butterflies blog you can snag up Leanne's free images. 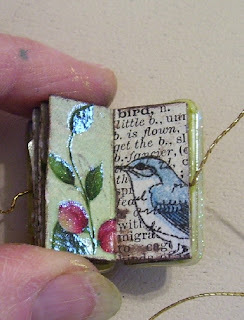 When I saw these I knew immediately I wanted to make a cute mini domino book. 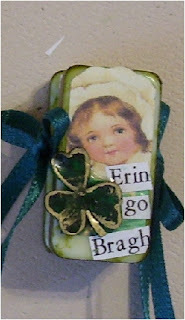 I didn't have any shamrock paper so I made myself a shamrock stamp out of fun foam and stamped my scrap paper with Peeled paint and stamped shamrocks on it. I made shamrock shrinky dinks. I messed them up a bit with my gold paint pen but hey, being that small it's hard to get precise. I used some known sayings for St. Patrick's day, nothing to long so they would fit on the tiny pages. This is the front. I had to crop and fussy cut the images so they may look a little different than Leanne's original images on Fripperies and Butterflies. And this is the accordion fold out. I even put a little Stickles on the brim of the hats, you can't see it but I just had to make it sparkle. I also added a nice gold sticker border around the outside, it almost looks like it was soldered. I think green and gold just naturally go together. Thanks Leanne for making this such a fun project for me. Can't wait to do more. And last but not least, I found a new swap blog called Tabby"sSwaps, hosted by lovely Kim. This month they are doing 1x3 cards in the theme of Vintage Children. These were fun, and quite quick. There isn't a lot of room to play with. I did do one digital image with Gimp brushes and a cute girl from FlickR. I added a neat puzzle sticker over one of my cards, you may have to click to see it up close but it is very interesting. Might have to use them a bit more often. Well thanks for sticking it out and I hope you have a lovely weekend. It snowed today but it won't last long now. We can only hope for warmer days ahead. oh how lovely Les....you have been busy....hope you get some sprng weather heading your way.. 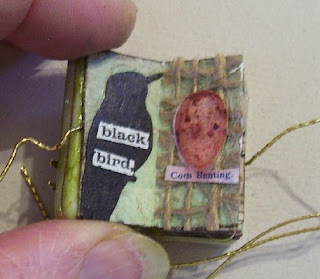 I love your little domino books! Aren't they fun to make? I'm so happy you found my friend Kim's blog and joined in on her first swap. Maybe we'll get to swap kids. Yours are adorable! 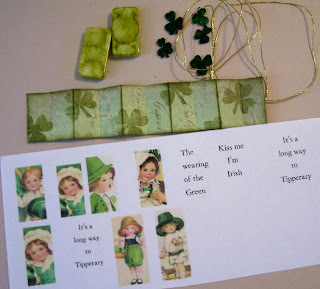 Wow.. love those little domino books.. bird one is just loverly.. but love the St. Paddy's one.. too cute.. like those cards.. that puzzle sticker looks interesting.. it was 11 here today!! and 5 days ago we were driving thru a foot of snow/blizzard.. go figure.. I love your little domino book, it is charming as can be! This is really sweet. :) Love it! 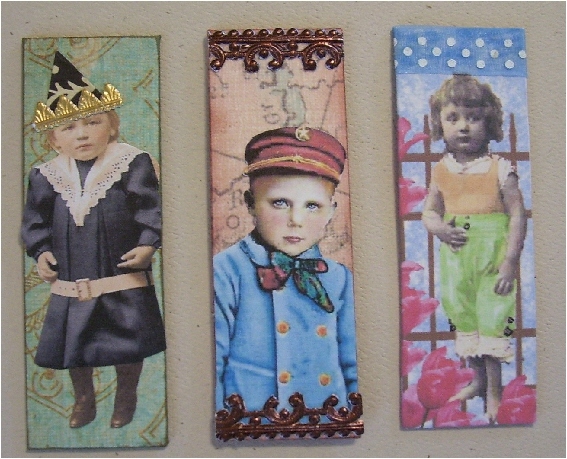 thank you for sharing all your interesting artwork Les! 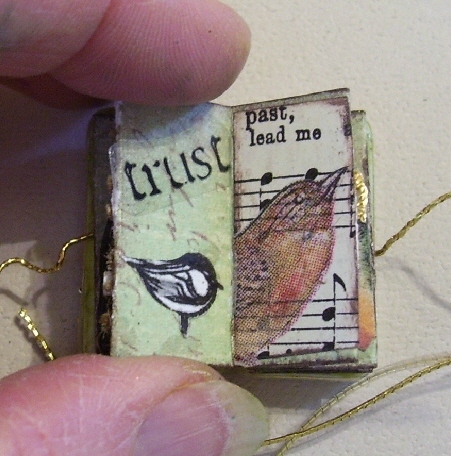 Lesley...I LOVE your little domino books!! I am doing the Tabby Swap too :0) maybe I will get one of your little beauties!! OMG..I just adore those little domino books!! Gorgeous work Les!! Les, First of all, those are adorable. Can you use the little wood dominoes? I always seem to find those at yard sales and have a whole coffee can of them for the kids. I have been NOT buying them because I have plenty. I'll look for them again if you can use them. Aren't you proud of the NOT Buying..see I really am not a hoarder!